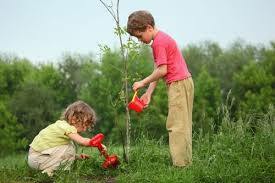 “Arbor Day (which means simply Tree Day) is now observed in every State in our Union – and mainly in the schools. At various times from January to December, but chiefly in this month of April, you give a day or part of a day to special exercises and perhaps to actual tree planting, in recognition of the importance of trees to us as a nation, and of what they yield in adornment, comfort, and useful products to the communities in which you live. It is well that you should celebrate your Arbor Day thoughtfully, for within your lifetime the Nation’s need of trees will become serious. We of an older generation can get along with what we have, though with growing hardship; but in your full manhood and womanhood you will want what nature once so bountifully supplied and man so thoughtlessly destroyed; and because of that want you will reproach us, not for what we have used, but for what we have wasted. For the nation as for the man or woman and the boy or girl, the road to success is the right use of what we have and the improvement of present opportunity. If you neglect to prepare yourselves now for the duties and responsibilities which will fall upon you later, if you do not learn the things which you will need to know when your school days are over, you will suffer the consequences. So any nation which in its youth lives only for the day, reaps without sowing, and consumes without husbanding must expect the penalty of the prodigal, whose labor could with difficulty find him the bare means of life.